DYNAMIC FORCES® - GUARDIANS OF GALAXY #14 100TH ISSUE ANIVERSARY CELEBRATION CGC GRADED 9.8! 100th issue ANIVERSARY CELEBRATION! 45 years in the making! It's finally here! 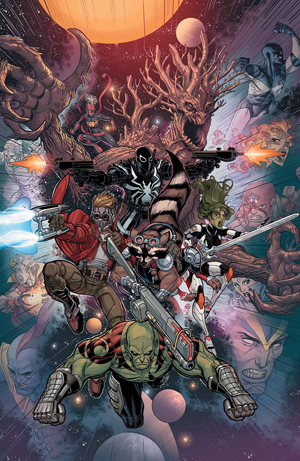 The 100th issue of Guardians of the Galaxy! (Okay it's actually the 101st, but we had an X-Men crossover to get through! Sheesh! ) It's an all-star celebration of the most popular super team of 2014 as cosmic captain Brian Michael Bendis welcomes Nick Bradshaw (Wolverine AND THE X-Men) to the team! As the GOTG gets ready for new members VENOM and CAPTAIN Marvel, there are unexpected dangers that promise to tear the team to its core. Plus in this special double sized anniversary issue...two special back up stories by former GOTG writers Dan Abnett and Andy Lanning!